One of the joys of older cars is that they were designed to be maintained over many years and don’t have redundancy built-in like most modern vehicles. Components were designed to be regularly serviced and repaired and not just thrown away. Brake shoes require the linings to be replaced from time to time depending on usage and driving style – so a regular check is a good idea. 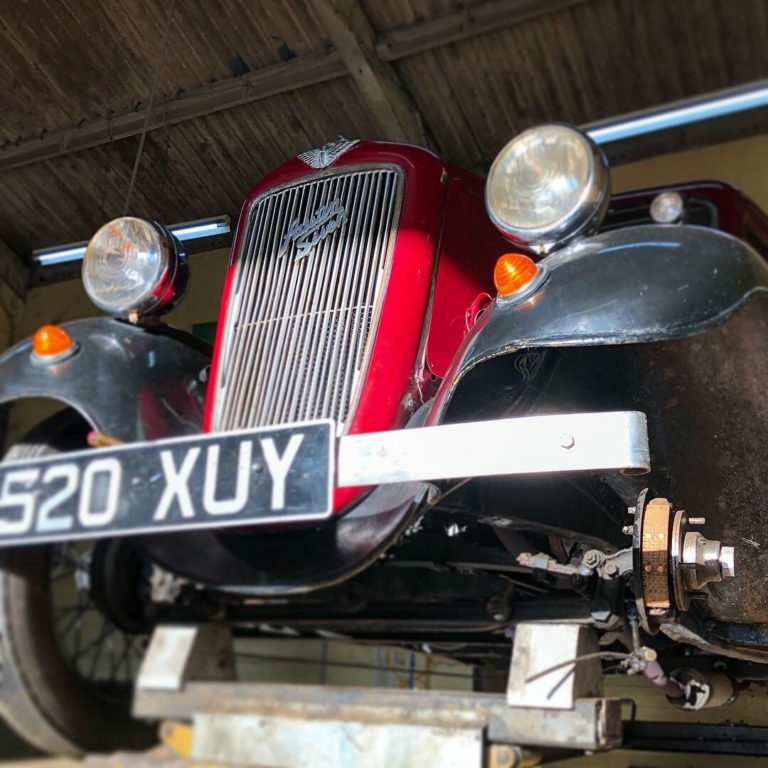 Relining brakes on this Austin Seven Ruby, which uses drum brakes, is a straightforward process. Once the brake shoes have been removed, the brass rivets that hold the lining to the face of the shoe need to be removed. The is accomplished by removing the head of the rivet before punching it out. Once the shoe has been properly cleaned the job of relining brakes can start. 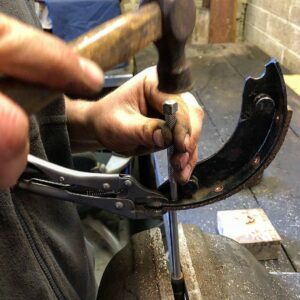 The new lining is held in place whilst the new rivets are carefully countersunk into the lining and held firmly by turning over the rivet head using a suitable riveting tool and anvil. Once back on the road and after a 100 miles or so of driving the brakes will require adjusting. This is to take up the wear on the brake linings from bedding-in. Tighten up the adjusters until the wheel no longer moves and then back off by a click and that should do nicely. If you would like your cars brake linings checked or renewed then please contact Wight Classics and we’d be very pleased to advise. Below, Charlie is learning this important new skill and ensuring that these cars can continue to benefit from good brakes for years to come. Thanks to Mark Greening at Alderton Austin Services for the advice and parts supply.